Tool-Rank is giving away a SKIL 2-piece 18-Volt Lithium Ion Cordless Combo Kits to one of our lucky readers. The combo kit includes an 18V lithium ion cordless drill and 18V cordless circular saw, This is a great kit for hobbyists, DIYers, and contractors alike, so be sure to enter. 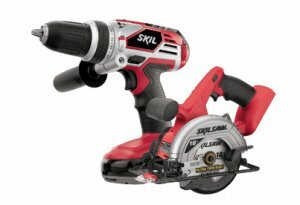 Check out our article on SKIL's newest cordless tools SKIL 18-Volt Cordless Lithium Ion Tools. All you have to do to enter is add a comment below. A big thanks to SKIL Tools for supplying the prize. Leave a comment below. You can leave any comment you want. A thank you to SKIL would be nice. Use a Valid email address. We need this to contact the winner. Contest is open to anyone in the 48 Contiguous States, 18 or older. One (1) Winner will be chosen randomly. The winner will receive one (1) SKIL 2-Piece 18V Combo Kit. Entries can be submitted until Sunday, May, 31st, at 11:59PM ET. Good luck! The giveaway is open only to legal residents to whom their delivery address for the prize is within the contiguous 48 states of the United States, who are 18 or older at the time of entry. Employees of the Sponsor and members of the immediate family (defined as spouse, parent, sibling, child and respective spouses regardless of where they reside) and/or those living in the same household of such employees are not eligible to enter. During the period from May 1, 2009 at 12:01 AM ET through May 31, 2009 at 11:59 PM ET (the "Sweepstakes Period") go to the article page and add a comment. A valid email address must be used on the comment form. All entries must be received during the Sweepstakes Period to be eligible. Tool-Rank.com's clock is the official time clock for the Sweepstakes. Limit one entry per person per address. Winner will be selected in a random drawing from among all eligible entries received. Prize drawing will be conducted on or about June 5, 2009 by Tool-Rank.com whose decisions are final and binding. Winner will be notified by email. One (1) prize will be awarded, consisting of: SKIL 18V Lithium Ion 2 Piece Cordless Kit. Approximate Retail Value of prize is $200.00. Odds of winning depends on the total number of eligible entries received. Prize consists of only those items specifically listed as part of the prize. Prize is awarded "as is" with no warranties, representations or guarantees, including but not limited to, quality, condition, merchantability or fitness for a particular purpose. Winner must look to the manufacturer for any warranties or guarantees. No transfer or substitution of prize, except by Sponsor in the event an advertised prize is not available. In such case, Sponsor may substitute a prize of equal or greater value. Taxes on prize are the sole responsibility of the winner. Any information gathered in the entry form will only be used to contact the winner. All other entry information will be deleted shortly after the winner receives the "Prize". Except where prohibited, each entrant agrees that: (1) any and all disputes, claims and causes of action arising out of or connected with this Sweepstakes or any prize awarded shall be resolved individually, without resort to any form of class action, and exclusively by state or federal courts situated in California, (2) any and all claims, judgments and awards shall be limited to actual out-of-pocket costs incurred, but in no event attorneys' fees; and (3) no punitive, incidental, special, consequential or other damages, including without limitation lost profits may be awarded (collectively, "Special Damages"), and (4) entrant hereby waives all rights to claim Special Damages and all rights to have such damages multiplied or increased. California law, without reference to California's choice of law rules, governs the Sweepstakes and all aspects related thereto.